There are people who have plans and those who are happy to let their lives be steered by events beyond their control. There are levels to which those with notions of how their lives will go are set in their ways and are willing to see other forces interact with and affect that. The expression “Man plans, God laughs” is perfectly descriptive of one such planner, the protagonist in “Maggie’s Plan,” who seeks to have a baby on her own and finds her life thrown into chaos when she starts to fall for a married man. 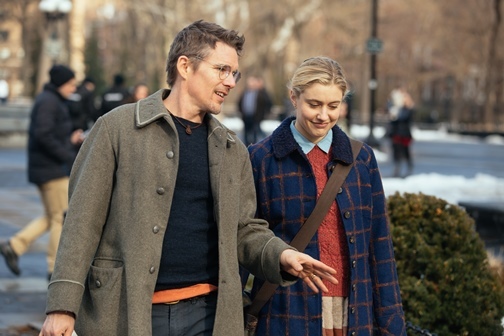 Maggie (Greta Gerwig) is a wide-eyed young professor in New York City who has decided that she will ask a high school friend, Guy (Travis Fimmel), to donate his sperm so that she can start a family since she has found no luck in pursuit of a boyfriend or future husband. Just as she is beginning that process, John (Ethan Hawke), a fellow professor and novelist, enters her life. Maggie begins to read his work in progress and can’t get him out of her head, and he finds himself similarly transfixed, a fact complicated by his marriage to intimidating Danish intellectual Georgette (Julianne Moore). Maggie thought she would follow the road that was best, but all that is disrupted when she realizes she might have to take another path. This film comes from Rebecca Miller, who is married to Daniel Day-Lewis and directs and writes films about as sporadically as her husband stars in them. This story, written by Miller and Karen Rinaldi, is a highly entertaining one that incorporates academia in a very effective way. John’s field is ficto-critical anthropology, which is equally pretentious and aggressively counterculture. The conversations these characters have border on absurd, but there is an intellectual grounding to all of them that enhances each scene greatly. Gerwig has established herself as a respected independent actress, and it’s hard to imagine anyone else in this part as she inhabits yet another free spirit guided mainly by her desire to be her own person and hardly prone to any directing pulls that don’t align with her sense of self. Hawke has fun with a role that allows him to depart from his “Boyhood” archetype, and Moore in particular seems to be having a blast with a thick accent and exaggerated character. In supporting roles as Maggie’s friends, Bill Hader and Maya Rudolph contribute controlled comedy, and Fimmel makes an impression as the undeniably peculiar Guy. 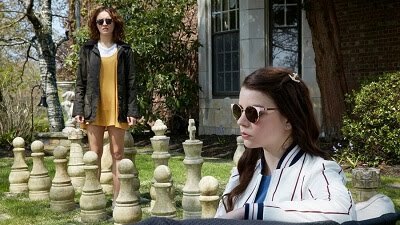 This film is a fun journey full of missteps with a strong script and committed cast, and a particularly clever second act.